There are two ways that users can download DNA sequence from JBrowse: in relation to a feature, like a gene, or by specific sequence coordinates. 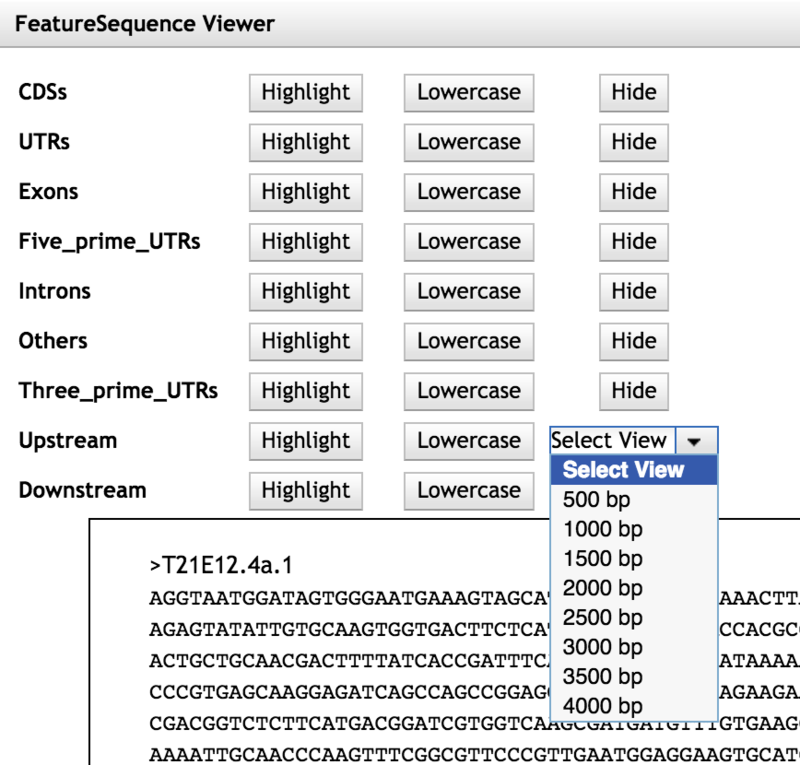 To get the sequence for a gene, open any of the “Curated Genes” tracks and right click or control click on the feature and select “View Sequence” from the resulting popup menu. If you are using the main “Curated Genes” track, you’ll get a dialog box asking which transcript you want to view. 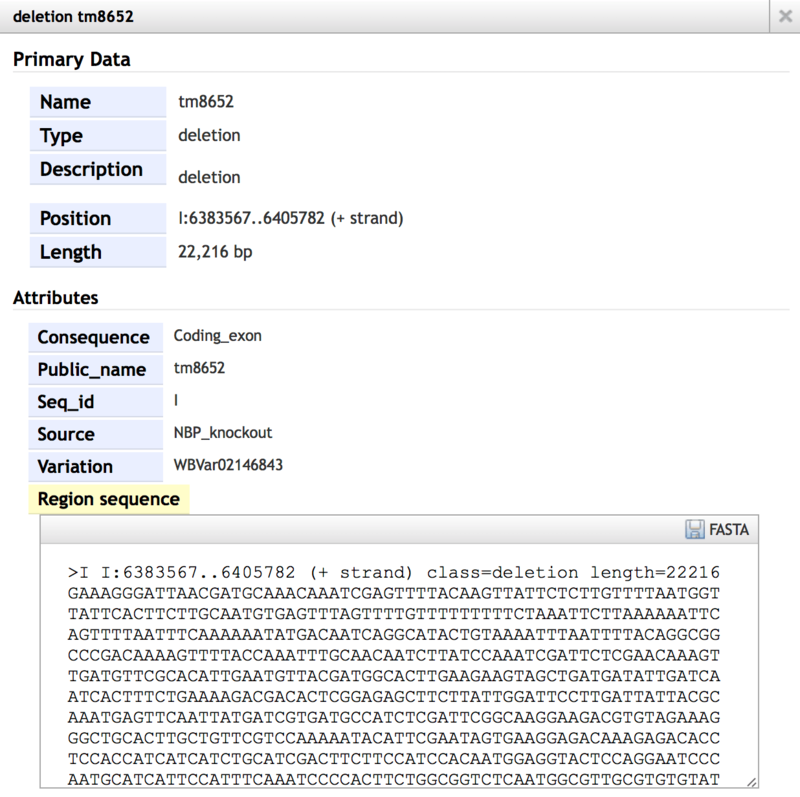 It does this because it needs to know what subfeatures like exons and introns can be shown. If you’re using one of the “type-specific” tracks (like “Curated Genes (noncoding)”), you won’t see this dialog because these tracks show individual transcripts rather than grouping the transcripts together like the “main” gene track does. It’s possible (in fact, likely) that you’ll be displayed a warning message about overlapping subfeatures (since exons and CDS overlap) and then be presented with a dialog box containing a list of subfeatures with buttons and the sequence below them. The buttons allow modifying the sequence display to highlight, hide or change the case of the subfeatures selected. For example, you could do an “in silico mRNA processing” by hiding the introns. In addition, there are drop down menus for showing a set range of up or downstream sequence, up to 4kb. This sequence can then be selected, copied and pasted into word processing program with highlighting preserved. Of course, hiding or changing the case will be preserved regardless of where it is pasted into. The highlighting tool doesn’t always get the subfeatures right! It sometimes gets confused when calculating boundaries and their overlaps. If it’s important, please take the time to check the results before using them. Highlighting doesn’t always get preserved when cutting and pasting, and it seems to depend on what browser is being used. In my hands, it works in Firefox but not in Safari or Chrome. If there are features other than those that are gene related, the process is similar. Control or right click on a feature and select “View Details” from the popup menu. The resulting dialog contains all of the information that JBrowse “knows” about the feature and, as long as it isn’t too long (ie, less than 250kb), will contain the sequence of the feature. In this instance you don’t even need to select and copy to get the sequence, since there is a “save as FASTA” button. If you need some other range of sequence not directly associated with a feature, we will make use of the “Save track data” functionality that is built into every track. 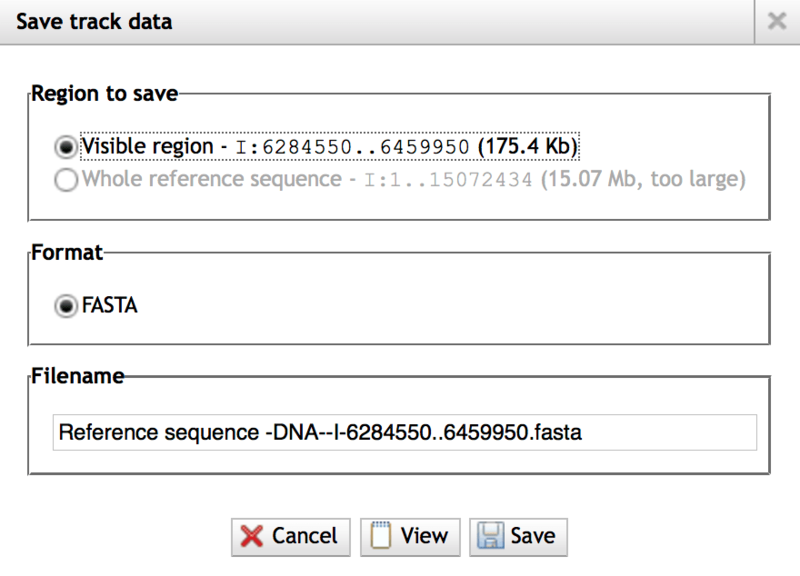 In this instance, we want to use the reference sequence track to get its data (ie, the DNA sequence). To do this, turn on the “Reference Sequence (DNA)” track. Then zoom, pan, search for a landmark or enter exact coordinates in the search field to the exact region that you want the sequence for. The coordinates are in the format “Chromosome:start..end” (like GBrowse, “II:20000..30000” for example). When you’re there, mouse over the track label (ie, the words “Reference Sequence (DNA)” in the JBrowse view) and the track label will become more opaque and a down triangle will appear, indicating a menu is available. Click on that triangle and select “Save track data” from the menu. You will be presented with a dialog menu that will let you either view or save the visible region as FASTA. There isn’t an option to pick where it gets saved, so look for it in your default download location, typically a Downloads folder. A useful side note is that this option is available for every track, so you can always download the data for the track you are looking at regardless of the data type. Stay up-to-date with what's happening at WormBase and in the C. elegans research community. Pick your format: RSS or low traffic email.